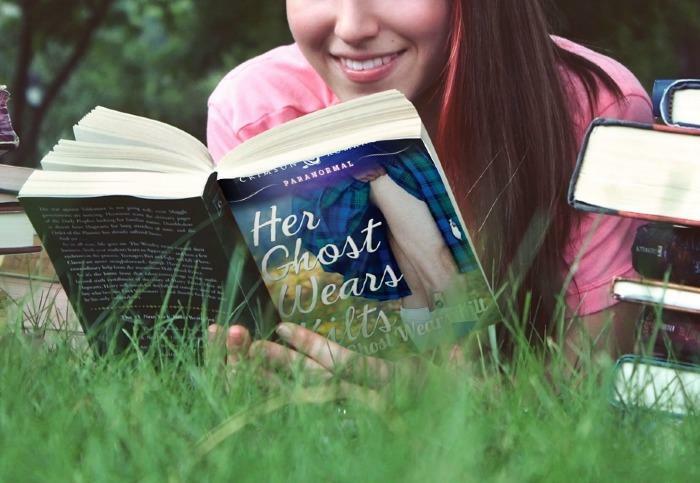 On the first stop of my Pump Up Your Book virtual book tour, The Literary Nook interviews the main character of Her Ghost Wears Kilts – Catharine Anne Baillie. Find out what this protagonist really thinks. How sheltered was I in my bookstore all those years? I’d never met such an oily psychopath. Image by Pump Up Your Book, virtual book tours. Those of you who haven’t read Her Ghost Wears Kilts published by Crimson Romance yet may not want to read any further. I advise you to click off the blog and spend this time grabbing a copy of HGWK instead for an enjoyable adventure. The following paragraphs may contain character content you’re not ready to know. Once you’ve finished reading, c’mon back and be excited with the rest of us. Yes, I’m finally working on the sequel to my paranormal romantic comedy and thoroughly enjoying being back with the cast of characters I came to love. Of course, Gillian Nation himself returns. The man has been a supporting actor in both Changes in Attitude and HGWK, so he’s on a roll and has his own fan base. Last night I sat in the stadium bleachers by the JV field of Black Lake High School, purportedly watching the youngest Bown boy go through his drills and plays of Thursday practice. However, most of those two hours, I had my head bent over a blank notebook and found my pen racing through scenes and concepts for the new book. Pages filled with black ink and adrenalin made my heart pound. The male lead actor in the story is named Brugh (sounds like Hugh). Yes, just like the fluffy four-footed love in my immediate family. But do note as this is important, the pup was named for the character, not the other way round. The character Brugh had already materialized for the sequel before I made the commitment to fall in love with the two Pomeranian puppies. Enough for now, I am hoping the three-day weekend ahead will be writing and laundry with breaks of lavish attention for Brugh and Bouncer. Enjoy yourselves and be safe. Get ready for a whirlwind, exciting virtual book tour set up by Bewitching Book Tours. On a wet, wild day in the Pacific Northwest with lightning and thunder as background music, I received my tour schedule from Roxanne Rhoades at Bewitching Book Tours. And with the horrific and beautiful weather outside came the cancellation of football practice for my grandson. Perfect. Gave me time to set up the tour schedule page here and share the good news. However, the lights are starting to blink, so it would be frustratingly ironic if the power goes out. I love interviews – radio, television and blogs. Yes, I am a media diva – spreading good cheer, fun stories and information wherever I go. Though the last time I had national exposure and drive-time interviews on radio stations back east, I was about forty pounds lighter. The best thing about virtual tours is I’m behind a computer screen. Ruh-roh, what about Skype? Hmm, well, so far none of the interviews are live or taped. According to the count down on my blog, it’s ten days before the start of the tour. I’ve been given instructions for my first few events and can’t wait to plunge in with anecdotes and fun facts of being a writer and publishing a paranormal romantic comedy. Let me post this while the power is still on.